Baselworld is an enormous show, and this year it ran for a week starting from 23 March. 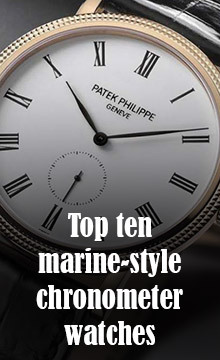 The major trends emerging from the stands were a confirmation of the popularity of blue dials, the rise of sports watches – pieces with some features of diving watches but intended for everyday use – a move towards lower prices, extra attention to the women’s watch sector with more mechanical watches and complications for ladies, and to the importance of in-house movements. It’s impossible for one person to see all the watches presented there, or even all the brands. So a selection like this will always be incomplete. Here is the TimeTransformed Baselworld 2017 Top 10. Zenith is a brand that deserves to be better-known than it is, and the Defy El Primero 21 is a watch that will help establish its rightful position in watch brand rankings. It is a 100th-second chronograph, with a chronograph seconds hand that rushes around the dial once a second. 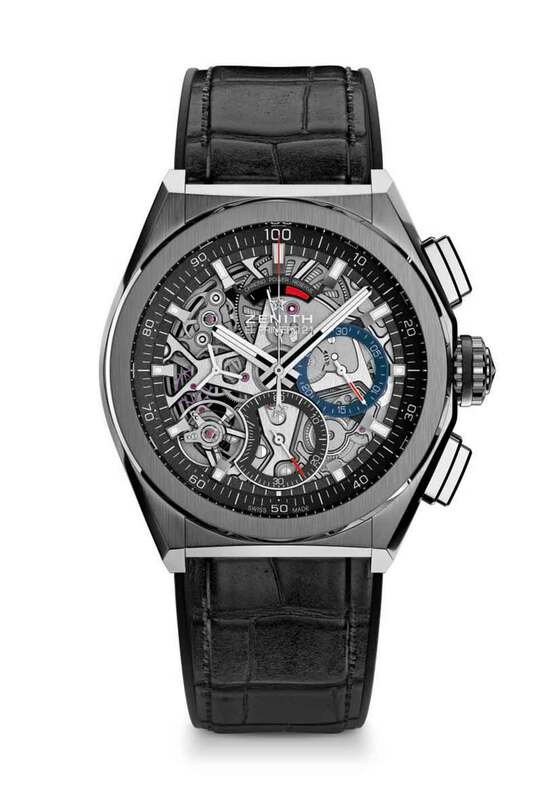 It has two gear trains, one for timekeeping and one for the chronograph, to ensure that starting the chronograph has no effect on precision, and the chronograph balance runs at 360,000 vibrations per hour, 50 Hertz. A remarkable watch at a very attractive price, considering its characteristics and the unique in-house movement: from €9,700. Read more here. 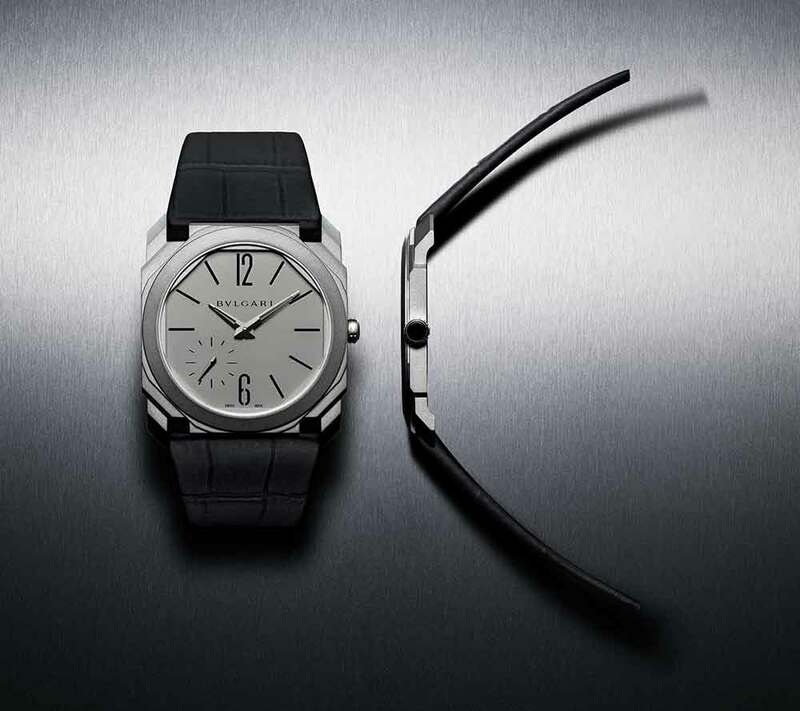 Bulgari claims another thinness record with the Octo Finissimo Automatic, the thinnest automatic watch in the world at 5.15 mm. It has all the sleek, dark, Italian-cool beauty typical of Bulgari watches, and it’s light, with case and dial in titanium. The offset subdial for continuous seconds is a quirky touch, and the brand have chosen to go without a date window. 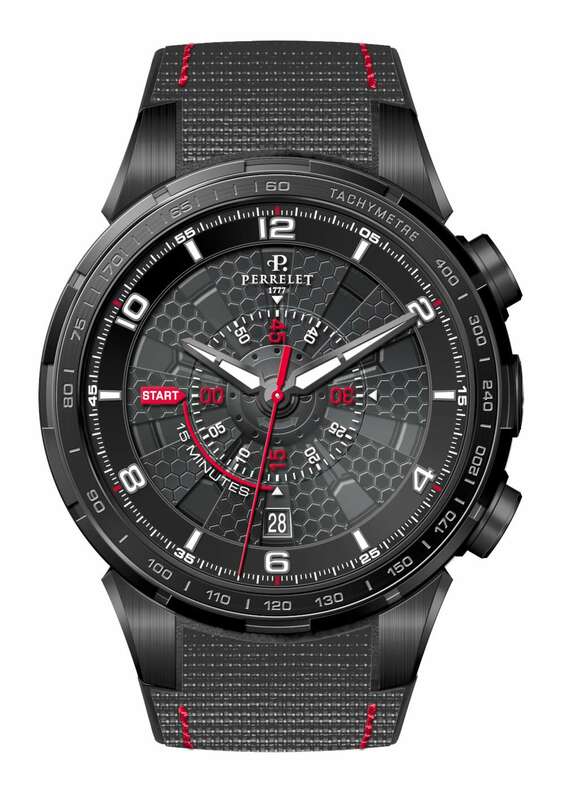 It is powered by an in-house movement, just 2.23 mm thick, but with a power reserve of 60 hours. Price from €12,500. Read more here. Breitling’s Navitimer Rattrapante has a new in-house split-seconds chronograph movement that incorporates two patents, it is COSC chronometer-certified, and it operates using the most prestigious chronograph layout, column wheel and vertical clutch. It comes in two versions, steel and gold, and the gold version has a display caseback. 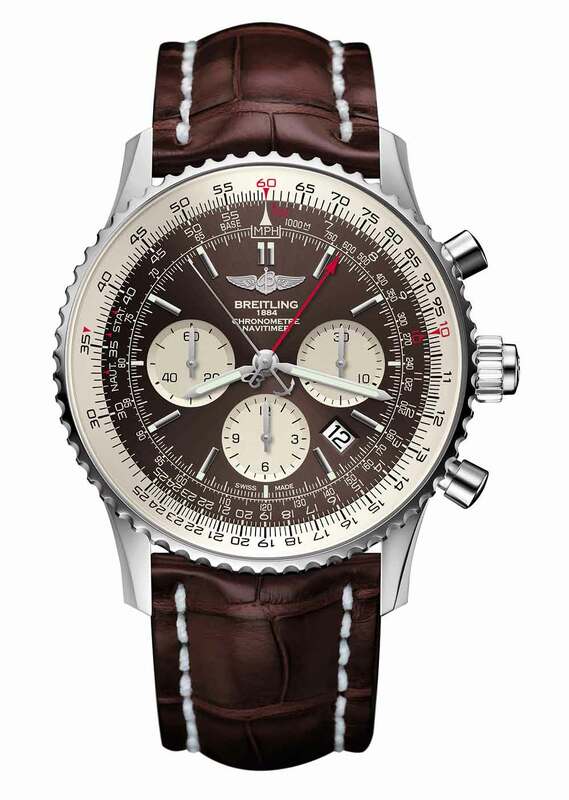 The dial is the classic Navitimer, with bidirectional rotating bezel providing a circular slide rule for calculations, conversions, percentages and so forth. Price €9,900 for the steel version, €28,400 for the red gold version. Read more here. 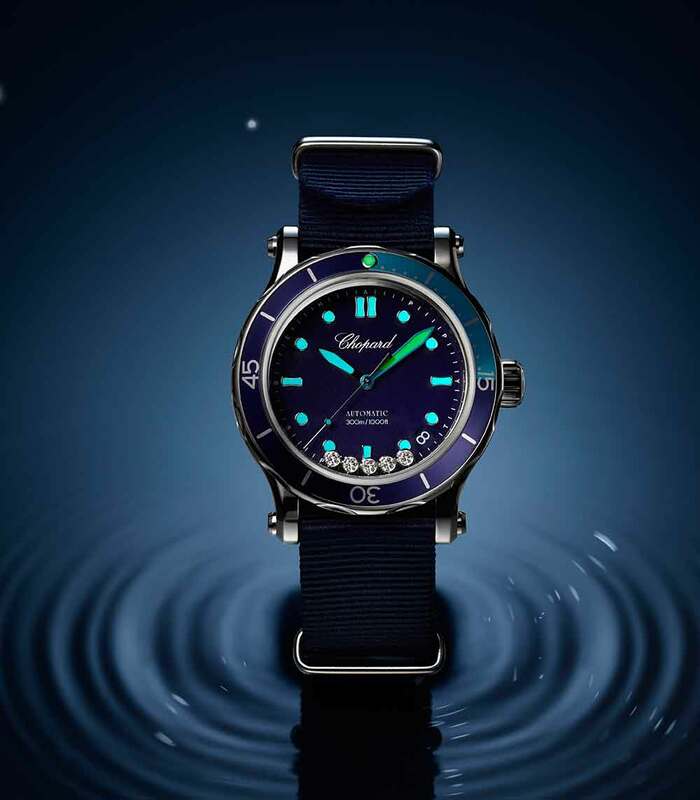 With the Happy Ocean, Chopard enters the sports watch sector. The watches have a 300-metre water resistance, a uni-directional rotating bezel, and other features taken from diving watches, but it’s above all a fun watch, with five mobile diamonds that move around on the dial. It’s extra-colourful by day, and also by night, with differentiated colours of SuperLuminova. It has an in-house automatic movement with a power reserve of 60 hours. The version in steel costs €7,690. Read more here. 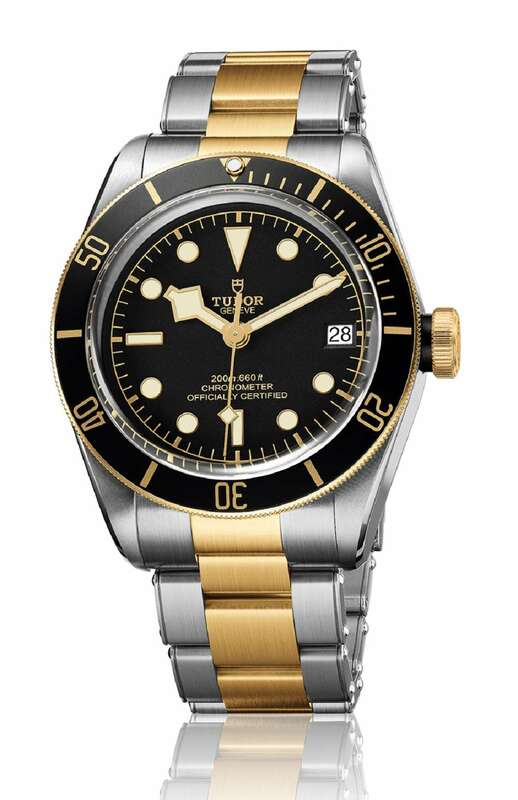 The Tudor Heritage Black Bay S&G propels the Black Bay diving watch into a category beyond the tool watch, with a mix of steel and gold (hence the name S&G). The brand has tried to create a differentiation with respect to big brother Rolex by giving the gold a brushed finish, making it less in-your-face bling when compared to Rolex watches. The combination of black with gold trim, on the rotating bezel and crown, make it a very attractive piece at an attractive price: from €3,600 with leather strap, €4,750 with steel bracelet. Not bad at all, considering that it has an in-house movement. The date window is nicely incorporated into the dial layout. Read more here. The Aquanaut Travel Time Ref. 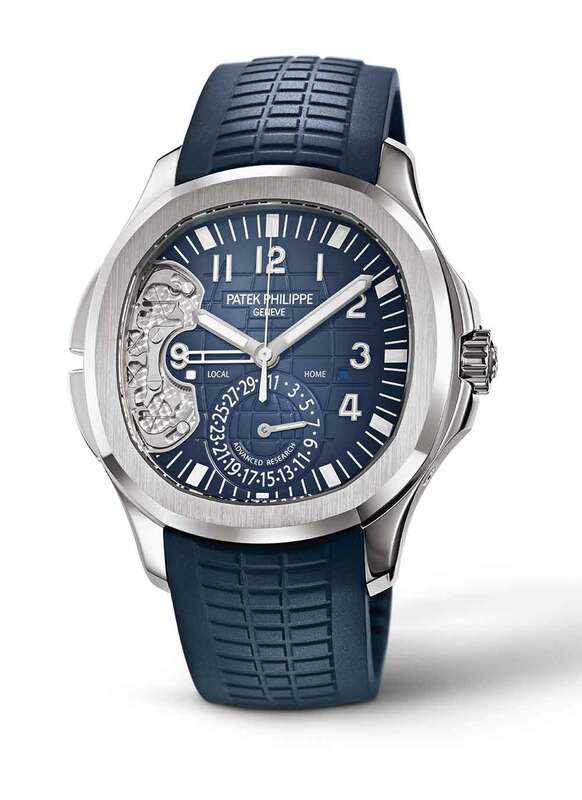 5650G by Patek Philippe is a watch that demonstrates the brand’s commitment to research, with a balance spring in Silinvar monocrystallizing silicon, pushers on the left-hand side of the case for adjusting local time backwards and forwards, and a “flexible mechanism” visible through an opening in the dial, part of the local hour-changing function. The hole in the dial is an unusual departure for Patek Philippe. Limited edition of 500 watches, price €54,390. Read more here. This watch is one of the few new chronographs to have a layout differing to the usual two or three subdials. The brand’s hallmark is the turbine on the dial, in this piece with a honeycomb texture (based on the segments of a soccer ball), which rotates with every movement of the wrist and adds some movement to the watch. Below the ten turbine blades is a subdial printed with the same hexagonal motif, only larger. In order not to disturb the turbine, the Perrelet designers have created a minutes chronograph counter in the form of a sapphire disc. The watch is powered by the self-winding P-361 in-house movement. Price €6,480. Read more here. 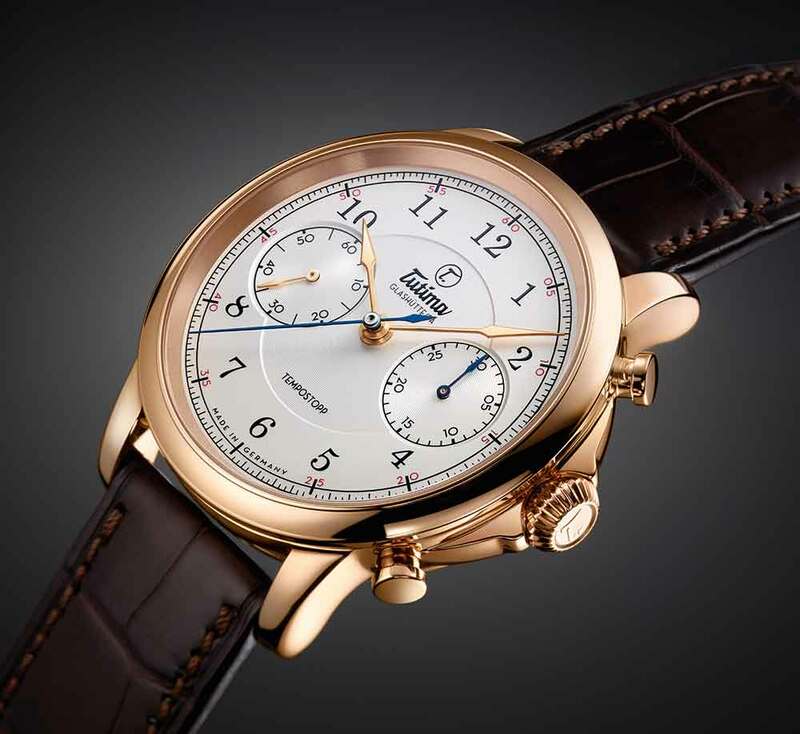 Tutima celebrates its 90th anniversary with a new version of the Tutima Fliegerchronograph made in the 1940s. At the time, the Fliegerchronograph was a landmark piece, perhaps the first German-made flyback chronograph. The flyback function was given the name Tempostopp at the time, and this has been used for the new watch. The 2017 Tutima Tempostopp has a new movement entirely developed and built by Tutima, Calibre T659. A beautiful, classical piece, with red gold case, and a sapphire caseback revealing the movement that has excellent finish with a contrast between gold-plated bridges and other parts in steel. Price €28,600. Read more here. Pierre DeRoche can be considered as the watch-making arm of movement manufacturer Dubois-Dépraz, and this piece benefits from this in-house capacity for movement design. The dial has an unusual arrangement, with power reserve display at bottom left, GMT subdial at top right, a date display with a crescent–tip hand pointing to numerals on the inner bezel flange, and a seconds hand that has been reduced to a tiny rotor at the centre of the dial. It’s a tough, all-weather watch, with a water resistance rating of 100 metres and the rugged-looking TNT case. 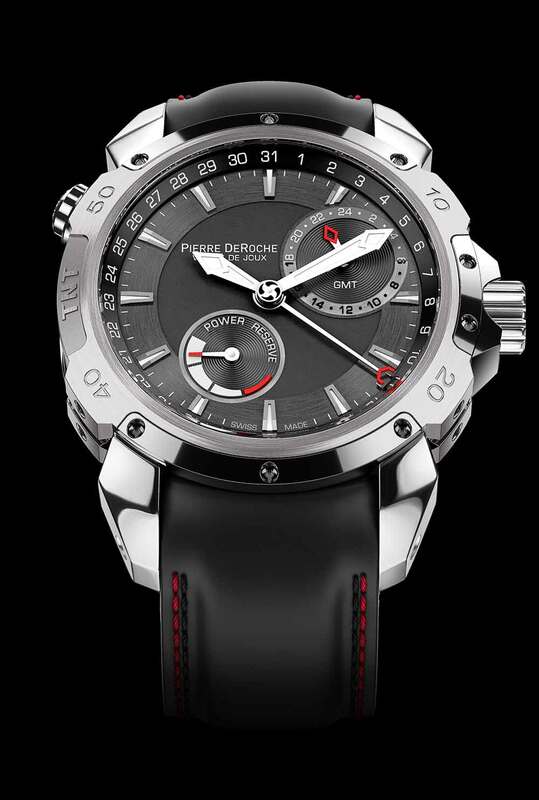 Price from 13,900 Swiss francs. Read more here. The Rolex Oyster Perpetual Yacht-Master II is the perfect example of the Rolex way: gradual modifications to an existing model, improving functionality and appearance. 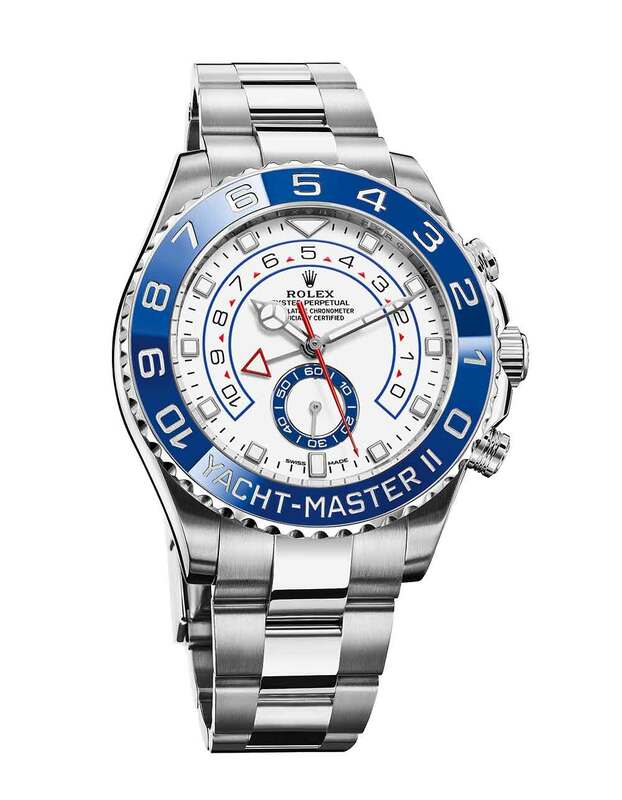 The 2017 Yacht-Master II doesn’t have all that much that is new – a triangular hour marker at 12 o’clock, a rectangular hour marker at 6 o’clock, new hour and minute hands that are visibly different – but it is an exceptional watch for the intelligence with which the Rolex designers have matched it to its function: timing the countdown to the start of a regatta. Price from £13,700. Read more here.